There aren't many amusement parks in Arizona. In fact, Phoenix and its environs remain one of the few large metropolitan areas in the US without a major park. Given the intense heat, however, it should probably come as no surprise that there are a number of Arizona water parks to provide relief along with fun. However, there have been plans floated to build a major theme park in northern Arizona near the entrance to the Grand Canyon National Park (which would capitalize on the many visitors who go there). So far, it's been just that: plans. The state's amusement parks and attractions are listed below and arranged alphabetically. This is the state's biggest park—but it's not all that big. 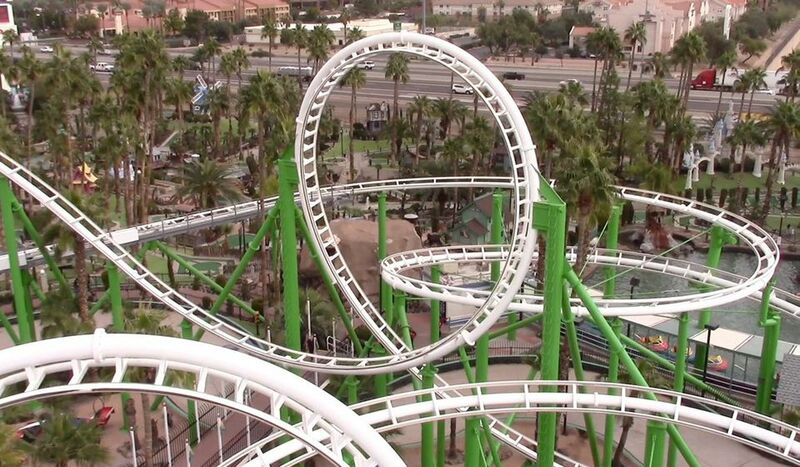 Attractions include two steel coasters, one of which includes inversions. There are also a few spinning rides, a zip line, a 3D motion theater, go-karts, mini-golf, and other attractions, presented with a castles motif. Some of the attractions, such as the XD Dark Ride, the Castles Cafe, and the arcade are located indoors. Most of the rides and attractions are outdoors. A small park for younger children. Perhaps the most thrilling ride is the Rock-N-Roll, a teacups-style attraction. Other rides include a carousel, a kiddie coaster, bumper boats, and a small train. It is located at Encanto Park. There is also a splash zone with sprayers and other ways to get wet and cool down. A climbing wall will challenge older children. Its owners call this a "theme park," but there are hardly any attractions at The Flintsones Bedrock City. There is a train ride, a slide, a model of a dinosaur...and not much else. You can order a bronto burger at Fred's Diner. We are pretty sure the burger is not actually made out of brontosaurus meat. If you go, be sure to have a yabba dabba doo time. The family entertainment center has a few kiddie rides including a mini roller coaster. Other attractions include go-karts, bumper boats, mini-golf, laser tag, and an arcade. Old Tucson Studios is not a theme park, per se. This real, working movie studio has a long-time Hollywood connection. It features tours, exhibits, and Wild West entertainment. Don't go expecting Universal Studios Hollywood. Rides include antique cars, a train, a carousel, and a walk-through mine. You can make reservations to ride horses on the park's trails. Schnepf Farms is an actual farm and not an amusement park. It does, however, offer a small roller coaster and a carousel, which it opens for special occasions. Wildlife World is a zoo, aquarium, and safari park with a few rides, such as a roller coaster, a swing ride, and a log flume. A zip line is also offered. Among the animals exhibited are sea lions, giraffes, stingrays, alligators, and kangaroos.